Before we dive into how iPaaS, aPaaS, and SaaS are all different, let's break down what each means. iPaaS stands for integration platform as a service. aPaaS stands for application platform and a service. SaaS stands for software as a service. Each of these serves a different purpose. aPaaS allows for rapid application development and delivery. This form has high productivity and high control. The coding process for platforms as a service can slow down delivery, but aPaaS brings automation for the application lifecycle. aPaaS offers a faster way to build apps. 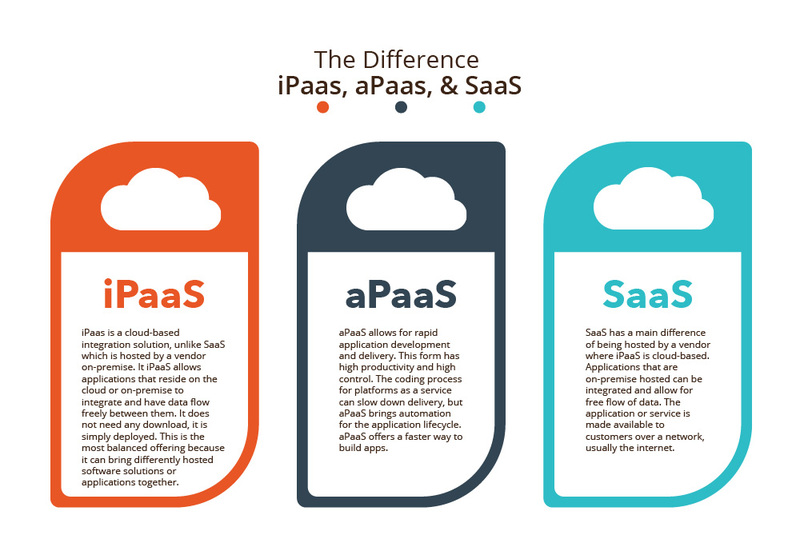 SaaS has a main difference of being hosted by a vendor where iPaaS is cloud-based. Applications that are on-premise hosted can be integrated and allow for free flow of data. The application or service is made available to customers over a network, usually the internet. iPaaS is a cloud-based integration solution, unlike SaaS which is hosted by a vendor on-premise. It iPaaS allows applications that reside on the cloud or on-premise to integrate and have data flow freely between them. It does not need any download, it is simply deployed. This is the most balanced offering because it can bring differently hosted software solutions or applications together. iPaaS+™ is a cloud-based integration solution, but it also offers business intelligence and reporting. iPaaS+™ has an ecosystem available that allows applications built to integrate with all other application in the ecosystem. Partners are able to leverage the power of multiple business essential applications through this ecosystem. Choose the integration type that will best serve your company in the long run. Find the right vendor can be difficult, but read this for help. To experience the iPaaS+™ difference and learn more, contact Ryvit.